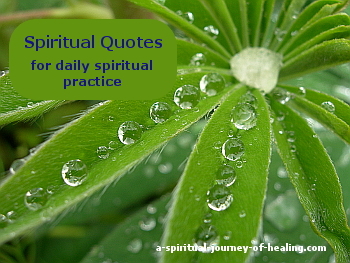 This article discusses how to use spiritual quotes as part of your spiritual practice . Also, why I mainly use the quotes from two holy books. If you want to view specific spirituality quotes on a-spiritual-journey-of-healing.com, click through from the links at the bottom of the page. How do quotes from spiritual books benefit and help us? Why do the spiritual quotes in my books (author Katherine T Owen is the writer of this website) come only from The Bible and A Course In Miracles? Spiritual verses from holy books can train our minds and spirits to allow God to talk to us directly. We meditate on the words and fall through the gaps into a first-hand experience of His love and wisdom. Spiritual quotes can also be used to claim a reality we do not yet experience. This can be an extremely powerful practice if the words from our holy book are taken as a promise from God. This is the same process which is operating in "the Law of Attraction". We set out to guide our chattering thoughts away from our current situation and instead practice thoughts that are aligned with our desired outcome. We call a new aspect of life into being. Claiming scriptures has been a huge part of my journey to survive and recover from 14 years of severe illness with ME/CFS. Just as we need to feed ourselves physically, so we need spiritual food. We can set aside time each day to use spirituality quotes to raise our faith for peace in a particular situation. Or simply to feed our spiritual connection. In some ways, I am glad I did not read the Bible or ACIM so much in the years when I was most deliberately allowing myself to hear God's voice and channel it through my poetry. It was such a joy and a validation of my journey to read these books later and find spirituality quotes that matched my own spiritual adventures and insights. I knew I was on a journey. But these texts let me know that I was on The Journey - the journey we are all on. We are all listening to the one voice. When you read spiritual quotes, you may get that aha feeling! Something resonates with you. You know the truth of it. Knowing someone has walked the path before you helps you to keep walking the spiritual path. It took me many years to start to read great benefit from spirituality quotes. Due to illness, I was forced to spend huge amounts of time in silence. I couldn't read much or do much and silent still pastimes were hard to find. I eventually realised that spirituality quotes and prayers were a perfect way to discipline my thoughts and to use the time well. 1. Write down your favourite spiritual quotes - somewhere you will see them. 2. Set aside a time each day when you will read your current quotation. 3. Think ahead to a time when you think you might lose your sense of peace. Decide which quotation will help you shift your perspective back to peace. 4. Learn your spirituality quote by heart if possible. 5. If you mislay your peace, silently say the quote to yourself. 6. See if you can remember to smile (maybe inwardly) for a moment at the drama of your life :-) You are being the observer and are not quite so lost in the story of it all. 7. If you realise the moment has gone and you have forgotten to say your spirituality quotes, forgive yourself. 8. Imagine the event and imagine you had remembered your spirituality quotes. Even though you didn't do so, this counts as practice and sets up your mind to remember next time! take this as confirmation that this quotation is calling changes into your life. Keep saying it even when it seems to be the least true! 10. Be gentle on yourself. You are using these powerful spiritual truths to create a space in your mind within which God can make all things new. Why do my books include spiritual quotes from only The Bible and A Course In Miracles (ACIM)? I very much believe there are many paths to God. Indeed, for a number of years I was not committed to any particular path. Why then have I included only spiritual quotes from the Bible and ACIM? 1. My knowledge of other spiritual texts is more limited. 2. I have moved forward more consistently on my spiritual journey since focussing on only two paths which, for me, are compatible. The spiritual journey is not easy. If we keep switching between paths, there is a risk we will circle the base of the mountain without ever going up. Both through ACIM and the Bible, I follow Jesus. 3. With regard to reading Bible verses, I have experienced unexpected benefits that I believe others might share. I have become aware of how much the Bible underpins British society. As I have learned to admire and love it, I feel I have not just made peace with Christianity, but also – to some extent – with my history and culture. This may be true for anyone in a country based on Christian principles. It may be all the more important for someone whose culture has suffered at the hands of Christianity. At the moment, the Bible triggers many people who have difficult experiences of religion growing up or who have been prejudiced by the media. The Bible is not in fashion! It is currently more fashionable in the West to read Buddhist quotes or Hindu verses, though the readers do not feel the need to consider themeselves Buddhist or Hindu. I hold a place for a time when people feel free to read the Bible whatever their spiritual path. It is an amazing book. I spent years doing general affirmations - I still do so. However I find that claiming health and claiming abundance through bible verses is far more effective. I experience these words as having an innate power. When I read these bible quotations I have a sense of joining my mind with all those millions who have said them down the milennia as well as all those who claim them now. 4. With regard to the spiritual text of A Course In Miracles, many people have not yet heard of this wonderful book and/or may be equally prejudiced against it. It has been a huge gift on my spiritual journey. It is my pleasure to introduce it to you. 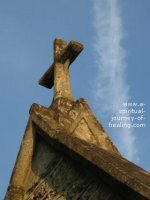 Quotes about resting in God, including quotes for claiming healing from insomnia. Christian Interfaith Quotes- We are one people with One God. I claimed these Bible verses to raise my faith for healing. Very important in my journey of surrender - the increasing realisation that God's will is my will. If God knows what is best, why would I want something else?! ACIM quotes. 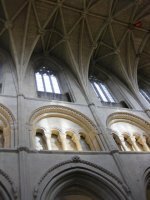 There are many articles on forgiveness on this site. Forgiveness is my main spiritual practice. 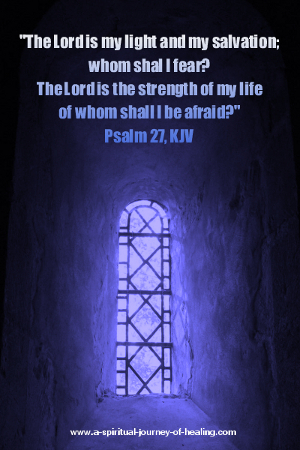 A powerful psalm of protection which I continue to pray over my life most days. Spiritual quotes to encourage us to see that when we don't follow God, we are following the ego. The ego does not bring us peace!